American Model Builders is a St. Louis, Missouri based company. 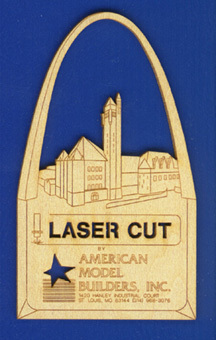 The sample showing the Gateway Arch and the St. Louis Union Station above the LASERkit and AMB logos was created with our laser. WHAT IS A LASERKIT®? LASERKITS® are designed in a Computer Assisted Drafting (CAD) program, then laser-machined at our computer-controlled laser workstations. LASERKITS® are cut and engraved from high quality woods (and occasionally styrene) with incredible precision and accuracy. The resulting edges are clean, need little, if any, sanding, and yield precise details, and exact-fitting parts. There is no frustrating, time-consuming, board by board construction with LASERKITS®. Side and roof pieces are tabbed and slotted, so no error can be made during assembly. Windows, doors, roofing materials, shingles, and trim boards are all laser-cut, and have a self adhesive backing which has been tested in the St. Louis summer heat and humidity, and found to hold under the most adverse conditions. ..while the experienced modeler can modify, super-detail, or elaborate to their heart's content. .." These are just a few of the comments we've heard from model railroaders who have purchased and built LASERKITS®! Revised: May 19, 2016 .